Bill, there are two ways to stop the Google Desktop Search engine on your computer. Approach 1 [Official] Right Click the Google Desktop Icon on your system tray and choose Exit item in the menu. Google Desktop will show a confirmation message asking if you like to run it the next time you start your computer. Say Yes. 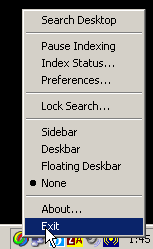 Approach 2 [Hack] If for some unknown reason the GDS icon is missing in your tray bar, open the Windows Task Manager by right clicking on the task bar or pressing Alt+Ctrl+Del. You will see three process running GoogleDesktop.exe, GoogleDesktopSetup.exe, GoogleDesktopIndex.exe, and GoogleDesktopCrawl.exe - right click on each of these process and choose the "End Process" menu. Google Desktop can be restarted from the Windows Start menu. Read some more Google Desktop Tips. Important Note: Google Desktop Search is essentially a local web server running on port 4664. When you install and run Zone Alarm [or another Firewall], it will throw a warning saying a process called GoogleDesktop.exe is trying to act as a server or trying to connect to the internet. Just click Yes with the "Don't ask again" option since GDS runs inside a web browser. Or Open ZoneAlarm, and go to the "Program Control" tab. Tick on Allow network and internet access for Google Desktop and save your settings. If you don't see the Google Desktop link on Google Web Search page or if Google Desktop results aren't included with your Google Web Search results, it may be because another program on your computer conflicts with Google Desktop. If Google Desktop is using 100% of CPU, just uninstall Google Desktop, restart your computer, and then reinstalling the latest version of Google Desktop from http://desktop.google.com.